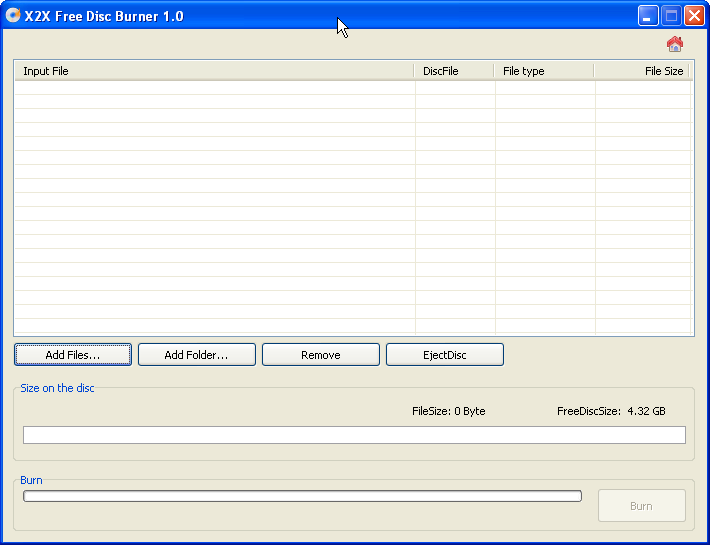 X2X Free Disc Burner is an easy-to-use, professional and free data disc burner which helps you burn files and folders to DVD/CD disc for free and backup all of your data like documents, images, videos, audios, programs and even a whole folder. X2X Free Disk Burner is designed with simple interface and perceptible buttons. X2X Free Disc Burner supports various disc formats including CD-R, CD-RW, DVD-R, DVD+R, DVD-RW, DVD+RW and DVD+R DL. ...... documents, images, videos, audios, programs and even a whole folder. X2X Free Disk Burner is designed with simple interface and perceptible buttons. X2X Free Disc Burner supports various disc formats including CD-R, CD-RW, DVD-R, DVD+R, DVD-RW, DVD+RW and DVD+R DL. * Super speed of disc loading, input files detecting and burning. * Support various disc formats including CD-R, CD-RW, DVD-R, DVD+R, DVD-RW, DVD+RW and DVD+R DL. * Backup any kind of data easily and quickly. * Extremely easy to use, friendly and straightforward note if there is inappropriate operation. * Support warning note after merger finished. * One-click button to clear the list after burning finished. * Offer advanced options with perceptible buttons to facilitate users' operation. * Support "Drag and Drop" to input files . a lightweight, powerful and rock-solid burning application cab work with drive. DisCryptor FREE is free security tool for your privacy protection. Use ChiliBurner to turn your favorite AVI, MPEG and WMV files into DVDs. Qweas is providing links to X2X Free Disc Burner 1.0 as a courtesy, and makes no representations regarding X2X Free Disc Burner or any other applications or any information related thereto. Any questions, complaints or claims regarding this application X2X Free Disc Burner 1.0 must be directed to the appropriate software vendor. You may click the publisher link of X2X Free Disc Burner on the top of this page to get more details about the vendor.